How easily could you sell something you knew nothing about? Few companies hire nothing but engineers. Most also staff business, marketing, and sales forces to aid the company in profiting from the services or products created by those engineers. But often those very employees so crucial to the process know little to nothing about the technology necessary to interface with their own engineers. For these employees, ignorance is NOT bliss! Twenty-five years in the technology field has taught me that under-trained employees are frustrated employees. 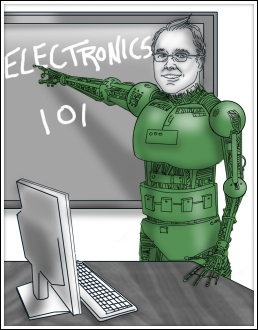 Therefore, I have designed an Electronics 101 seminar to help your employees understand your products and services from the technological standpoint. This informative seminar, which can be customized to address your unique needs, is based on my book Bebop to the Boolean Boogie – An Unconventional Guide to Electronics, now in its third edition and formerly a textbook at Yale University. I can conduct seminars locally or regionally for just about any size group. If I do say so myself (although I really shouldn´t), I am rather well known for my enthusiastic presentation style and for making these seminars fun and easy to understand. Contact me today to talk about your electronics seminar needs! Copyright © 2019 Maxfield High-Tech Consulting, LLC., All rights Reserved.